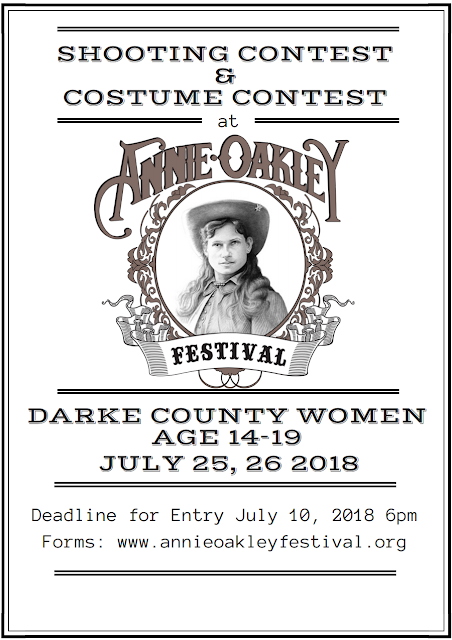 DarkeJournal.com: The Annie Oakley Committee is looking for the next Miss Annie Oakley!! The Annie Oakley Committee is looking for the next Miss Annie Oakley!! The Annie Oakley Festival Committee is preparing for the 2018 Annie Oakley Festival, and our new 2018 Miss Annie Oakley!! We are looking for Darke County Women, ages 14-19, who would like to become the 2018 Miss Annie Oakley. For more information, please go to our website: www.annieoakleyfestival.org. There will be a Shooting Contest and a Costume Contest for all who sign up. Cash prizes will be awarded in the Shooting Contest, to the 2018 Miss Annie Oakley, and the first and second runner up. If you have any questions, please feel free to contact the Annie Oakley Festival President at 937-548-1018 or by email at: mellings@embarqmail.com.